Since the introduction of Android’s notification bar, the focus has been getting the information you want, when you need it. 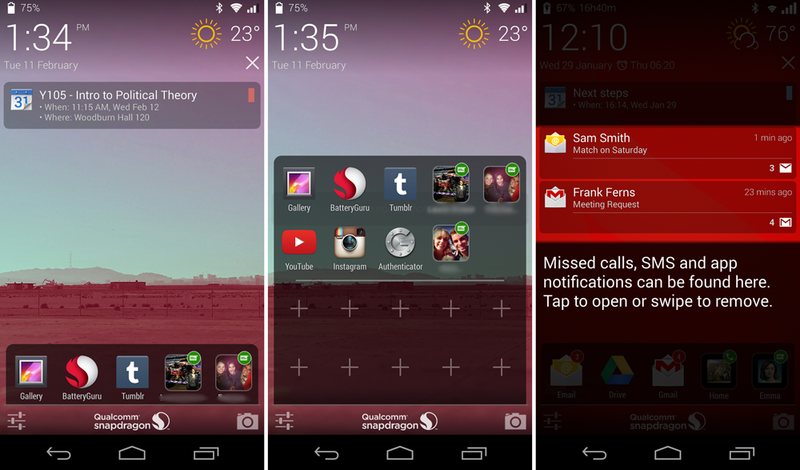 Up until the release of Android 4.2, the Android lockscreen was unexplored territory as far as getting your notifications and information, but that is quickly changing. Qualcomm Glance, its lockscreen replacement now in open beta, wants to learn from your habits and surroundings to give you information at a glance. What makes Glance different from other lockscreen replacements is the amount of your phone’s info that it has access to. To install Glance, you also need to install Qualcomm’s battery monitor, BatteryGuru. I’d like to say that setting up Glance is a quick install, but BatteryGuru and Glance both have menus that you need to tweak before they really kick in. BatteryGuru and Glance monitor your phone’s apps, data intake, and when you use your device to best deliver the information when you need it. Current weather, upcoming appointments, and relevant apps are all featured on your screen whenever you wake it from sleep mode. Hitting home or back takes you to your regular lockscreen or straight to the homescreen if you have it disabled. The app is still in beta and Qualcomm is asking you to help work out the kinks, but as far as lockscreen replacements go, Qualcomm has a good start here.